Who Buys Unused Toner Cartridges? We do! 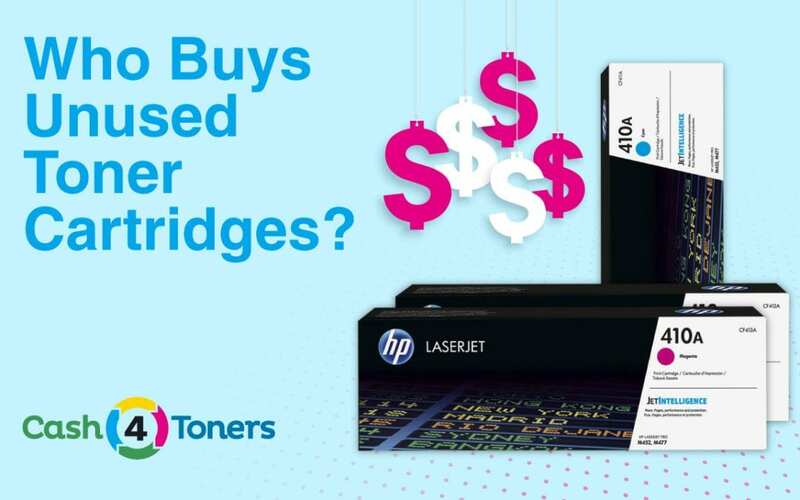 Cash4Toners is on a relentless quest to rid the world of excess and surplus toner. Why? Because there is no excess or surplus toner…only toner cartridges that haven’t found the right home yet! Cash4Toners will find your unused toner a new, loving home, and put cash in your pocket, too! Where Did All This Toner Come From? Regardless of how you acquired excess toner cartridges, you need to get rid of them. How much is your old toner worth? Short answer: More than you think! Where Do I Sell Excess Toner? Pull those unused toner cartridges out of the supply closet and get them into play. Somebody, somewhere needs your toner cartridge! Cash4Toners will put cash in your pocket, clear up space in your office, and, most importantly, we’ll get your old toner a new, loving home, or we’ll make sure it is properly disposed of and recycled. You’re happy (and a few dollars richer! ), we’re happy, the Earth is happy…win, win, win! Don’t throw your old toner out…cash it out! Is The Earth Really Happy? Absolutely! Recycling toner cartridges helps the environment. Currently, more than 375 million empty ink and toner cartridges are thrown in the trash each year. This is a staggering number, especially since 100% of the materials used to manufacture ink and toner cartridges can be recycled and reused. Sitting in landfills, ink and toner cartridges take more than 100 years to break down, and release pollutants and toxins in the process. Also, nearly a gallon of oil is used in the production of a new toner cartridge. By recycling toner cartridges, we save millions of gallons of oil! Make Mother Earth happy! 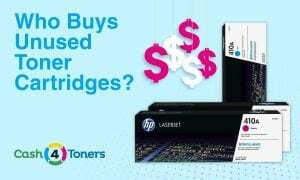 Sell your unused toner cartridges to Cash4Toners! Cash 4 Toners built its reputation on a bedrock of customer service. We make selling your unused toner cartridges fast, easy, and profitable. Check out our more than 3,000 five-star customer reviews and see for yourself! We’ve been in the toner buyback business for nearly a decade — you won’t find a more trusted or reputable toner buyback program than Cash4Toners. Cash4Toners is by far the best toner buyback site on the web. A couple clicks and that’s it! Cash 4 Toners offers free shipping and has a simple online form with dropdown menus that allow you to choose the brand of toner cartridge, part number, condition, and quantity. Cash 4 Toners pays via PayPal or check and will provide a free shipping label for you to use when mailing your toner cartridges. It doesn’t end there! In addition to toner, Cash4Toners also buys genuine OEM drum units, developer kits, fuser kits, maintenance kits, solid inks, printer ribbons, and more!